(March 13, 2014, The Auk: Ornithological Advances)—A study published in The Auk: Ornithological Advances shows that species of African Vultures that feed earlier in the day obtain more food than those that feed later. “The earlier you can get to the carcass, the more successful you can be,” says Dr. Corinne Kendall, who conducted the research in the Masai Mara National Reserve in Kenya during her graduate studies at Princeton University. Experimentation is at the heart of robust ecological research, and it is especially so to test predictions of foraging theories. Ornithologists have often pioneered sophisticated experiments in the lab and large-scale manipulations in the field. 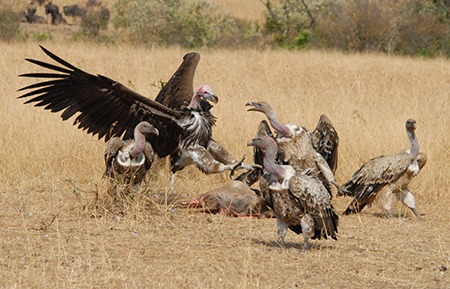 Kendall’s research on vultures used provisioned carcasses to assess the interaction between time of day and species identity in competing scavengers. In natural conditions, carcasses are more plentiful in the morning, particularly during the dry season when animals are dying of starvation, Kendall says, so that should be the best time for vultures to feed. Although she predicted that the larger-winged and less competitive Lappet-faced Vultures would feed in the morning, she found that the smaller and more social White-backed and Ruppell’s vultures dominated the experimental carcasses early in the day and quickly got full. Kendall wanted to find out how the vultures reduce competition for food and to learn whether certain strategies work better than others for acquiring food. The more social vultures got more food because they are able to find food earlier in the day, and they filled their crops early. The more solitary Lappet-faced Vultures, which prefer to eat alone or in pairs, sought their food in the afternoon and, as a result, fewer were able to fill their crops. The results show that even vultures can have too much of a good thing; daily satiation by a dominant species in the morning generates a time window in the afternoon during which a subordinate species is able to feed, but it is still not enough to compensate for being excluded from the carcasses earlier in the day, and so overall competition for carrion remains intense on a daily basis. “Vulture foraging ecology is interesting not just from a scientific standpoint, but from an ecosystem standpoint as well,” Kendall says. “These are species that are preventing disease and controlling waste by getting rid of carrion.” It’s important to understand the role they play in getting rid of carrion, and how that reduces human diseases. “It’s not a glamorous job, but it’s an important role in the environment,” Kendall says. Read the article, “The early bird gets the carcass: Temporal segregation and its effects on foraging success in avian scavengers,” online. About the Journal: The Auk: Ornithological Advances is a peer-reviewed, international journal of ornithology. The journal has been the official publication of the American Ornithologists’ Union (www.aou.org) since 1884. In 2009, The Auk was honored as one of the 100 most influential journals of biology and medicine over the past 100 years, and currently holds the top impact factor among ornithological journals. Previous Previous post: Collisions with buildings add up to second-highest cause of death for birds in the U.S.